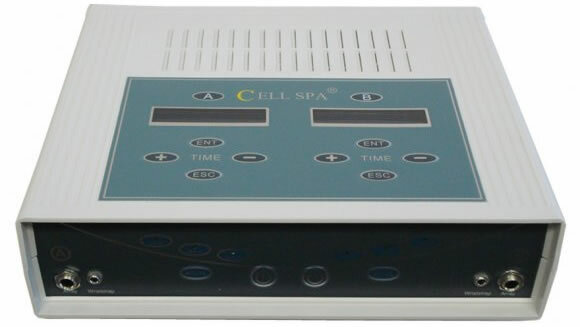 Dual Cell Spa Ion Cleanse Machine (2 Machines in one) with 2 Fir belts, aluminium case... Complete Kit. Digital LCD display. Show current curved line on the screen. Max-quality, dual-coil arrays; stainless-steel internals. Use worldwide; works with 110v & 220v power sources. FIR belt. More effective and powerful. More energy can go up to 90ºC within 5 minutes, and give out more rays than normal belt; more safe 100% covered with silver insulation material; belt is longer than others suitable for big persons. Reduce the ach and inflammation. Cure athletes feet and fungal nails. Assists in resolution of inflammatory infiltrated edema and exudes. 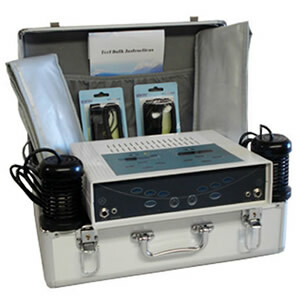 The Detox Aqua Foot Bath Cleanse System is a professional detoxification system which helps with total body purification. Ions are molecules that in most cases carry either a positive or negative charge. When the machine is turned on ions are created in the water. When the unit is set to positive, the current is directed to the positive pole, which produces more negative ions in the water inducing a positive polarity that generates a negative ion flow which raises blood pH from acidic toward alkaline in scientific studies. When the detox unit is set to negative, the current is directed to the negative pole and the opposite occurs, which results in more positive ions in the water and the negative polarity generates a positive ion flow which lowers blood pH from alkaline towards acidic. In today's world it is estimated that over 95% of people in our modern society experience a chemical imbalance within their bodies which causes an excess of hydrogen ions, and their blood pH is lower than optimal (7.45 pH). These people will greatly benefit from exposure to high concentrations of negatively charged ions. Water is broken down into lots of energy ions(namely positive and negative ions). these active energy ions penetrate into human body via capillary bore and cell membrane and thus supply body with negative ions. after complex biochemical reaction the positive and negative ions in body release high energy, increase the vigor of cells and promote the all kinds of enzyme(ferment). They also improve the metabolism. in 30 minutues, toxin and wastes such as aged cells that accumulated in body will be expelled fast and safely and human body will recuperate gradually. Many colors and objects appear in the water during an ionic cleanse session. For mostly people, the water color will be changed into brown or darken except few people who has numerous toxins from some organs of the body. It is important to understand that the water will change color even if the unit is operating without feet in the water. In fact, the darken color (including the "rust" smell) is not all your toxins from your body. It`s the result of the reaction between all of the variables in the water (the toxins, particles in the water, the salt added to the water) and the metals in the array and the acidity or alkalinity of the person being bathed. The toxins in our bodies will look the same as the toxins predominant in a specific area; however, there will be more toxic particles in the water with feet in it. You will also find that water-based toxins will not stick to the side of the bucket and array and is easily rinsed off, whereas substances pulled from the body will form a sticky ring that must be removed with the mixture of vinegar and water. We hope you can make your purchase decision after you think over it. The detoxification work is not so obvious for every person and it is a long term work. 2 arrays, 2 wrist strap,1 power cord, carrying case, 2 FIR belts and 1 instruction manual. The system does not claim to cure or treat any disease or injury. It assists your body to re-balance its bio--energy field and stimulates the body for self-detoxification. The body’s organs will naturally function better when the electro-magnetic fields are charged. The ion energy charged. Foot—bath will help you feel young again. Detox the easy way with our technologically advanced, user friendly detoxifying dual Ionic foot spa system which 2 people can enjoy at the same time!